Believe it or not, for most people in India the word SBI is synonymous with “trust” in banking. The reasons are obvious, the amount of time it is around an the second thing is that it’s a govt. bank. Both these factors became instrumental in roping in huge number of customers when SBI decided to introduce it’s credit card services in India. While we may be vocal in the lapses in customer care services from SBICard just as there are with other credit card companies like HDFC and Yesbank, however, no one can deny the fact that SBI with the sheer number of customers may very well be the largest credit card issuer in the country soon. I used to own a SimplyCLICK credit card but for totally personal reasons and not for much benefit, I have swapped it for SimplySAVE card. If you consider embossed cards, no one can deny that SBI has some of the most beautiful looking cards in the industry. This card is not an exception too. The card is issued on two platforms- VISA and Mastercard. Earlier, the VISA one came with ‘VISA Platinum” written and Mastercard , came in with “Mastercard Titanium” written. I got this card just a few days ago. Since, I held a Mastercard variant of SimplyCLICK card, so when I swapped my card, I was given a Mastercard variant of SimplySAVE card. It comes in wonderful blue colour with “₹” inside the design. It looks great. The card also flaunts the new Mastercard logo and is devoid of the “Titanium” branding. The card comes with a welcome benefit of 2000 RPs if you spend more than ₹2000 within 60 days of card set issuance. This guarantees the amount of ₹500 as CB for the joining fees that you give (₹500 + GST). You get 10X RPs for spends on Dining, Movies, Grocery and Departmental Stores. This is the biggest benefit of the card. If you are among the people who have the habit of purchasing stuff from local marts like Big Bazar or so, you’ll love this card for getting you flat 2.5% CB. And this is huge as no card with such low joining and annual fees allows such CB. The Base Reward Earning rate is 1 RP for ₹100 spent (0.25% CB). This is not beneficial for those who spend more on other categories and online shopping. For the online expenditure, SBI SimplyCLICK Cards are more apt. 1% fuel surcharge waiver across ALL petrol pumps. The upper cap of surcharge waiver is ₹100/month for txn spends between ₹500 to ₹3000. Membership fee of ₹500 + GST is waived off if your annual spends are more than ₹90,000. This is quite easily achievable. As with other SBI Cards, you can apply for a maximum of 2 add on cards which come for free. One of the biggest benefits of the card is that you can redeem the points accrued as statement credit. The minimum points required to redeem is 2000 RPs. This is a good way to redeem the points. However, what we don’t know is whether there is any redemption fee or not. One of the biggest advantages of holding an SBI Credit Card is that SBI runs 10-15% off campaigns on websites like Flipkart, Amazon, Snapdeal etc all through the year during many sales. This kind of discounts itself warrants the need of keeping an SBI Credit Card in the wallet. I am sure many of us have used these discounts in the past. UPDATE: As many users are mentioning there is a redemption fee of ₹99 + GST. Please ask them before redemption. What do you think of this card? Do you consider it better for low spenders? Have you owned this card in past or plan to own it for your parents? Do let us know in the comments section below. Is the statement credit option available on Simply click too? I’m having some 7000 points available for redemption. And if not, can I take Amazon evouchers without paying 99+gst? Hey abhishek, I am using simply click card for 4 months now. Loving due to i mostly shop online. Can I redeem points as statement credit? Can i hold two Sbi cards?? Do let me know. Thanks in advance. I don’t think you can redeem it for statement credit. However, you can hold two cards I guess. Can you please clarify the second point? Do they allow holding of two cards? There is an option to apply online and there chose that you already hold a SBI card. They will ask for the existing card number and few details. Try doing this. It should work. You cannot redeem points for statement credit in simply click card. You have to either choose between amazon e-gift voucher or cleartrip e-voucher. No other kinds of rewards available for simplyclick card. You cannot hold two unsecured cards from SBI. If you need another card you may opt for a card against fixed deposit. Advantage series cards are given against FD. You can try redeeming the points for cash in mobikwik via max under redemption options.I dont think you will be charged redemption fees.But do let know. Yes, You can i hold SBI SimplySave and SBI Prime. Could you please explain how you got two cards? when i tried to redeem it for cash credit they told minimum 5k points so i went with lifestyle e gift vouchers. for such gift vouchers there is no redemption fee levied. and notable thing is their 10x points calculation is a bit different so you will always get few points lesser. 1.Abhishek why did’t you opted for SBI Prime ? 2. Do they increase credit limit when you change the card ? 3. How much credit limit you have ? There are a few details that I want to share. 1st, each customer care representative gives a different information. The 1st time I called a representative, I was told that in my account I can only swap my existing card for SBI Yatra card or SBI Gold and More Unsecured Card (I don’t know if it is the standard card that they are talking about or not.). And then I asked if I can upgrade to SBI Prime or not, then I was told that for upgradation, the account didn’t show an option of SBI Prime card, however I can upgrade to SBI Elite as that is being shown. It sounded ridiculous to be honest. So I hung up and called another time. This time when I asked about swapping to SBI SimplySAVE, they said they can raise a request and I’ll get a decision within next 11 days. I was amazed as he said I could swap where as the previous executive said I could not. Anyways, I placed the request and the very next day I saw that the card in my account showed SBI SimplySAVE. So, I immediately understood that my swap has been approved. Now regarding why I didn’t take SBI Prime. SBI Prime is for someone who doesn’t have Super Premium Credit Cards or better who spends mostly on Utility bills. If that’s the case then SBI Prime will get you significant returns. The max return that you can get is 5% that is only on standing instructions. Other than that the returns are okayish. I already have Diners Black (3.33% returns on any spends) and Yes First Exclusive (2.5% returns on any spends) so it wasn’t so much of a deal for me to upgrade to SBI Prime. Plus if you spend above 3 lakh in a year on Prime, only then you can get it for free otherwise ₹3000 plus GST has to be paid. I actually took it for my Dad who does offline shopping and hence SIMPLY SAVE gives 2.5% as CB. It made sense to hold this card. Hence the choice. 🙂 I’ll may be think of upgrading to SBI Prime when I have a big need to standing instructions like house rent and all. Let’s see. And by the way, the CL is not increased. Only the card was swapped. I didn’t need any limit increase as of now. Even if your spends don’t exceed 3 lakhs on the Prime card still the renewal fee can be negated with SI. For example, if your rent is Rs 15000/month and Elec is 2000/month on an average you can get up to Rs.10,000/- as statement credit per Year. Less the renewal fee of 3000 + tax. You could easily save INR 6000. Yes. I told you if you want to have that card primarily for utility bills then you can break even. However I pay through Diners Black which gives me flat 3.33% CB irrespective of any spends. So for me that card isn’t of much value. As SBI Prime only gives 0.25% on other spends. I have a simply save card and redeemed 2000 points as credit in my next statement. I was charged 99 + (17. 8 cgst + 17.8 igst) but it was reversed same day. So net Rs 500 was credited in my statement. Hi Abhishek Sir, Need a help regarding this. I got call from Yesbank and opened first account with them with 10 lacs check. He told me about lifetime free credit card himself. Sir my question is will they check my gross total income or gross turnover in my ITR for credit card application? Well, in your case, the chance of getting the card is through different guidelines as you have agreed to become their Yes Fist Savings Bank account holder. Even though they will ask for the ITR or Salary Slips, tell your RM that you need the Yes First Exclusive/Preferred card LTF otherwise you’ll consider closing your account. I think they might be able to help you and get you the same. No, i just call customer care to redeem my points. Even CC guys told me , i will be charged 99 + ST. But when i checked my statement, 99 + ST was first debited and then credited . Hi Abhishek, yeah this card is good for offline spends. I hold simply click visa card, which is good for online spends, which gives average 3% cb, ( with milestone achievement ). One thing i would like to confirm from you, wether it has domestic MasterCard lounge access or not? Can you call to MasterCard Helpline and confirm? No, it doesn’t have any lounge access. I ave already confirmed. Hello Sir.. I have gained a lot of knowledge by reading your posts here. Wanted to apply for SBI IRCTC credit card. 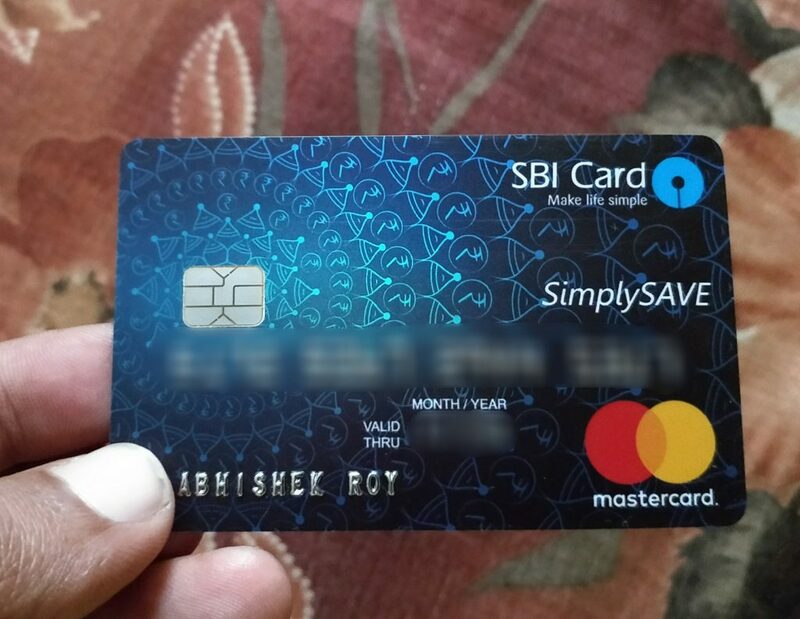 I am already using SBI Simplysave card. I applied for SBI IRCTC credit card online through their site multiple times every time I got a message that an executive will contact for further processing. But no one contacts. Lodged a complaint online but still no resolution. Can you please guide is there any other way to apply for SBI IRCTC card. Is it safe to apply through bank Bazaar? Yes you can apply through Bank Bazaar or any such sites. If they don’t contact then there is little you can do. My first card in my second stinct with credit cards. This has greatly improved my credit score. Close to a year back I swapped it with CLICK card after getting better cards for retail transactions. This is definitely a good card for beginners who do retail transactions in the 10x categories. I filled fuel worth Rs. 1000 in my car and saved 127 Rs. Thats cool 13% saved on Fuel. And amex plat travel is not HNI card, I got it for 13 Lacks ITR and received 3 Lacks Credit Limit. You are absolutely correct. We do encourage readers to use different cards for different purposes in order to maximise the gains. I have yet not approached them for limit increase. Getting the limit increased requires patience. Kindly wait for auto increase if you don’t have ITR or Salary Slips. Hi SIr. If ITR is approx 4.75 lacs, what according to your experience should be good credit card limit? I have only 50k limit. Should i go for an increase as its almost 11 months and my last ITR was 2.5 lacs on basis of which they issued me credit card. Wait for 12 months and see if there is an offer of auto credit limit. If it isn’t there till say 14 months then apply with credit limit enhancing form with ITR. You will get increase. 99 redemption fee is not applicable for statement credit. There is a Rs 99 fee for statement credit which was charged to my Prime card. It was also not reversed. No fee for e-vouchers. I too have Simply save and statement credit fee was reversed with reversal entry on same date as debit. Not sure if it should vary from card to card in SBI. Also I had request statement credit through email. Thanks for the info about CIBIL enquiry by BB and bank both. As 2 hard pull on CIBIL will reduce CIBIL score too much..
No, that’s not the case. Bank bazaar do make an enquiry but that is known as ‘soft enquiry’ which doesn’t affect your credit score at all. It is same when you ask for your credit score from cibil directly. It is the ‘hard enquiry’ of the lenders which pulls down your credit score a bit. But why would one select this card in lieu of Stan Chart’s Manhattan card. There the CB on departmental stores is 5% (as opposed to 2.5% here), with no charges on redemption (and the ensuing drama of having it rolled back). One also gets 20% CB on Uber (capped at Rs 600 / month) provided spend is more than 15K in month. They also reverse the fee if annual spend is more than 60K (my wife has had it reversed for even lower spend). So I fail to understand the value proposition of this card. You have to raise a request for swapping your IRCTC card to simply click. In most cases they do it. No, you can’t change MC to Visa. While swiping your card, you can ask for a Visa card, once issued, they usually don’t allow changing the franchisee from MC ti Visa or vice-versa. Hi Arvind how did you apply for SBI IRCTC credit card? Can you please give advice. Hi Santosh Prasad, you can apply through the SBICards website “https://www.sbicard.com/”. Not only SBI IRCTC credit card, but you can select whichever card you want based on the requirements and eligibility conditions. Has anyone swapped SBI Central or FBB cards to SimplyClick or SimplySave? any idea about sbi simply save pro credit card?? Any Idea about sbi simply save PRO and sbi prime PRO credit cards??? There is no PRO card. I haven’t seen any. My father holds one: simply save pro. idk whats the difference. just wanted to know your valuable opinion on the recently launched SBI air india signature card.plannig a post anytime soon? Simply Save SBI Card Titanium Master Card , what Amount of sum is insured in case of accidental death ? Hi abhishek , currently i am using a sbi simply save card . How can i swap or convert it to sbi simply click card . Please help me. Call their customer care and tell them to initiate a card swap. I have done it past, it can be done. They might tell you that, there is no offer or such, but just tell them to take the request. The backend team usually processes the application. What’s the process to convert Visa card to MasterCard? And to prime from elite? So SBI approched me for their Elite & Prime CC’s since I had an old relationship with them “Savings” and no CC’s with them. I had told them no since I had the DCB at the time and even after my downgrade to Regalia I still did not want to get Elite or Prime but everyday spends was a problem “Reached Regalia 8lac spend” so requested the new etihad card instead of the Elite and with a quick Card to Card application I got something else delevered instead. The suprise was not only that they had given me a simplySAVE instead of a ETIHAD but also the huge limit they gave which as almost equal to my AXIS card of almost 10Lac. Have to keep on using this card since cant take a hit like that on cibil but atleast 10x is good on a few things. I have recently taken a Simply save advantage visa card against fixed deposit. Is there any difference from the normal simply save.Bessides does visa give any offers separately.